Journal Friday: Why Keep a Journal? 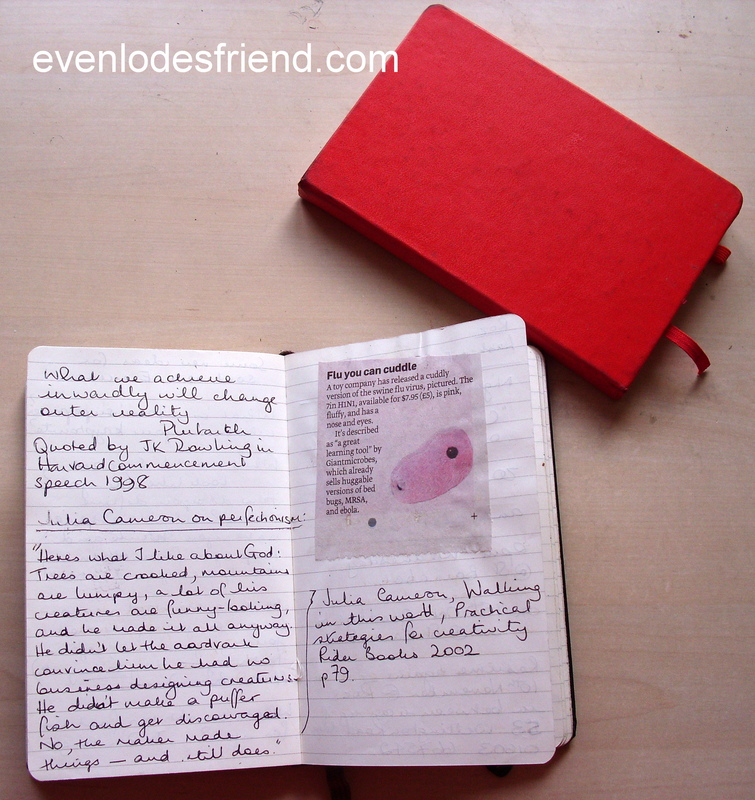 Every Friday we will be talking about Journalling here at Evenlode’s Friend. Today, we are starting right at the beginning – why would you bother? You should keep a diary. Every young lady should keep a diary. And that was it. Thirty-eight years later, I am still doing it. But why have I kept going that long? After all, there must be more than my father’s kindly injunction. My diary has been my friend and confidante through good times and bad, In it, I have confided my grief at my father’s death, and my joy at the births of my nieces and nephews. I have recorded my struggles with anorexia, depression, Chronic Fatigue Syndrome. I have worked through emotional issues. I have raved about my lovers, and often I have raved at them. I have documented my marriage and my creative life. I have made lists and plans, and scribbled cartoons, stuck in newspaper clippings, and written page after page of thoughts and feelings that I could share with nobody else. My diary has been safe place where I could work things out. It has been my therapist, my friend and my memory. But there is more! 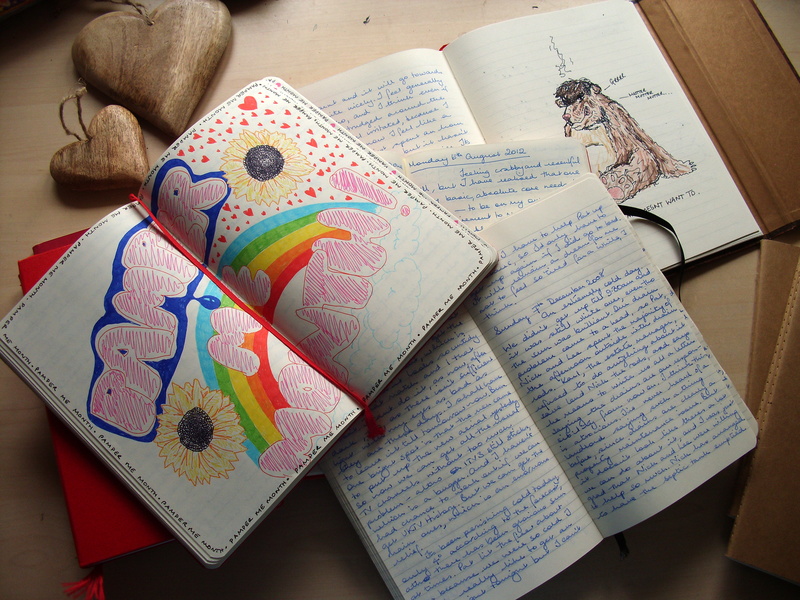 My diary is the springboard into my creative life. 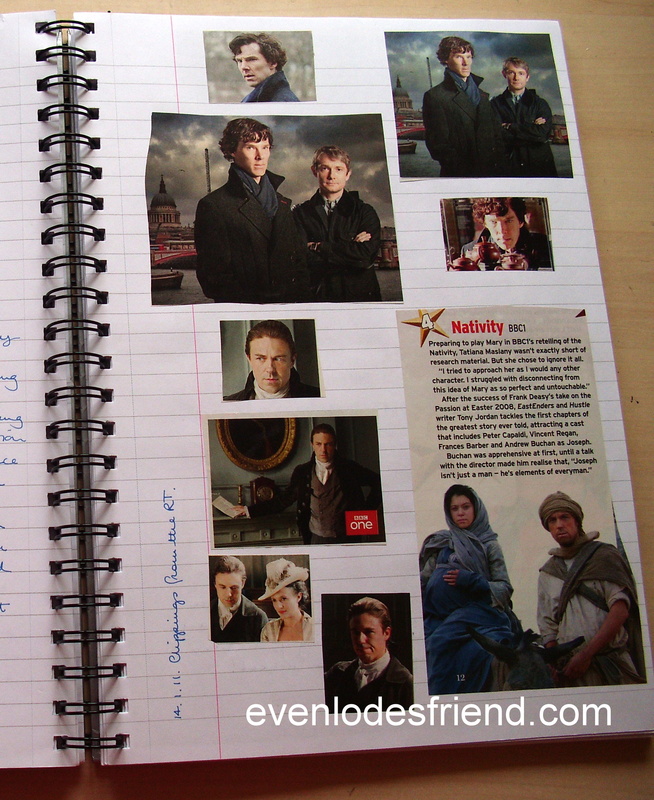 I always write my diary before I begin a creative writing session. I find it clears the everyday worries and grumbles out, so that I can start with the clean slate of my imagination. It is also a place where I can write about the problems I might be having with a particular story or project, or acts as a kind of ideas book for new things I might try. It is a kind of creative mentor, a place to encourage myself, a place to prepare for the joy of creativity. As I have said above, I don’t just write in my diary. I draw and stick things in. I am a very visual person, and sometimes it is easier to record an image of something in my head than to try and write it down. Usually cartoons are the result of trying to explain a feeling. Once its out on the page, especially if its a feeling I am having trouble with, like the ‘grumpy bear’ feeling shown in the picture above, it dissipates. I hand write my diaries. With a fountain pen. Partly this is because I feel I want to make something beautiful, and I think handwriting is an act of making art. But mainly it is because I believe that my hand makes a direct connection with my subconscious brain. It makes it easier to express what is going on inside – sometimes to express things I don’t even know I am thinking until they come out! I keep my main journal in a hardback A5 notebook with blank pages. I am currently using the Moleskine kind, which you can find here. I like blank pages because I occasionally draw. I like the A5 size because it is portable and fits in a handbag easily. I’ve experimented with all shapes and sizes over the years, but this is the one that consistently works for me. 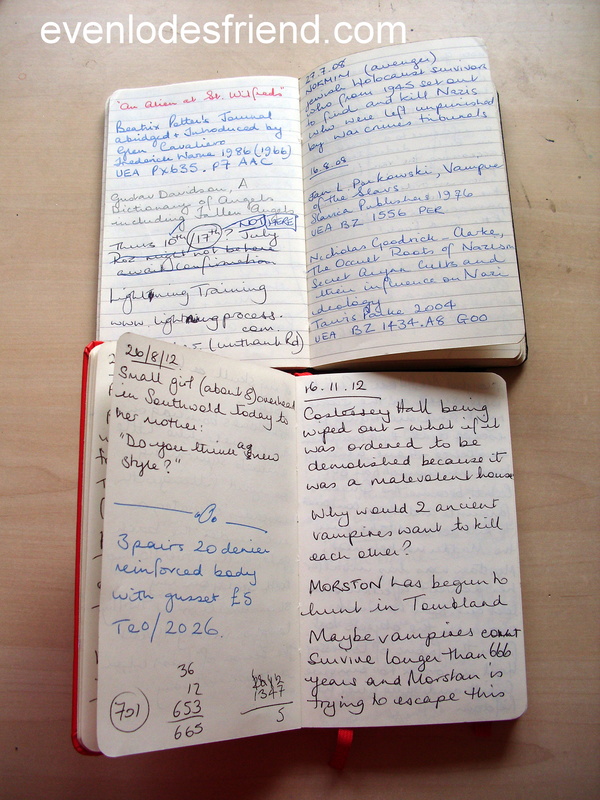 Lots of people begin a diary on 1st January, meaning to write an entry every day. By about the 15th, they have usually given up. For some people, it happens every year. Do you fancy keeping a journal? Are the benefits listed above something you would like? 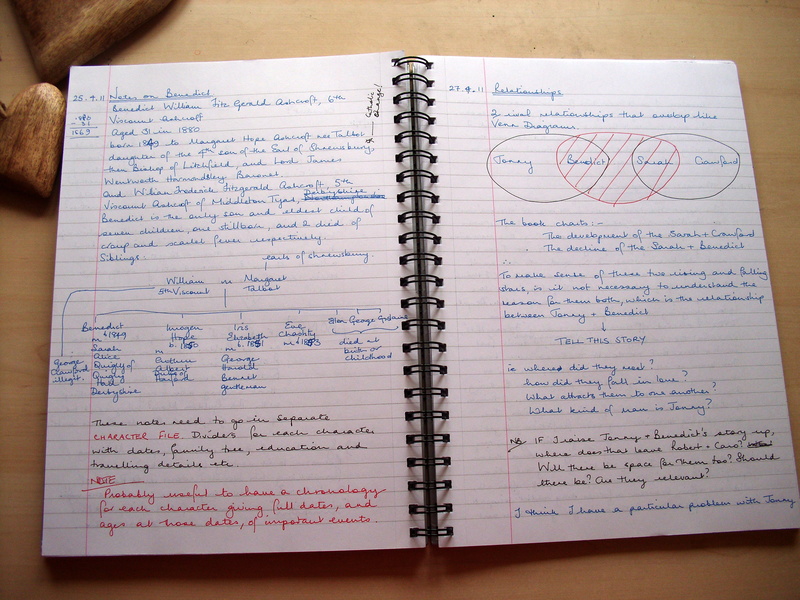 This weekend, why not go out and see if you can find yourself a nice notebook to write in. Something you are drawn to, that you like to handle and use, but not so beautiful that you are afraid to write in it. There are all kinds of arguments for different sizes and bindings of notebooks, from paperbacked and spiral bound, to hardbacked tooled leather. Consider your lifestyle and how you mean to use it. Do you plan to write it only at your desk, or in bed, or will it need to be sturdy enough to travel around in your bag? Above all, find something you like. If you don’t like it, you won’t use it. Make sure you write your name and contact details inside the cover. That way, if you lose it, some nice person can always return it to you. Next Friday, I will offer you a journal prompt to get you going, but if you want to write something in the meantime, either just get going, or think about what you want to get out of writing a diary, and write that down. And don’t forget to date your entry! This entry was posted in Journal Friday, Journaling, Writing and tagged Diary, journal, Moleskine on 19.04.13 by evenlode1967.